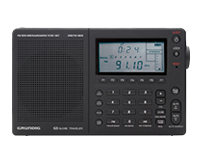 Universal Radio has just posted a product page for a new Grundig portable–the Grundig G3 Voyager. Feature wise, it looks like a marriage of the G6 and G5 in that it has full LW/MW/AM/FM coverage, plus the G6’s aircraft band. Physically, the G3 resembles the G5. What could make the G3 Voyager a highly competitive portable, though, is the fact that it will offer Synchronous Detection. This feature reduces fading and adjacent station interference on shortwave frequencies. The other notable portable with this feature is the trusty Sony ICF-7600GR. Note that the G3 has not not hit retailer shelves yet, nor does it have FCC approval. Subscribe to our RSS feed, or check back here often as we will announce when the G3 becomes available. UPDATE 01/10/09 – Etón has now released a product spec sheet (below) and has the G3 listed on their website (link below). UPDATE: The Grundig G5 no longer appears on the etón website. Perhaps the G3 is replacing it? Please comment on this post or contact me if you have more information about the G3. I will add info as it becomes available. This entry was posted in News and tagged Etón, G3, Grundig, Grundig G3, Radios, Shortwave Radios on December 22, 2008 by Thomas. Pingback: The SWLing Post » Blog Archive » The Grundig G3 Voyager–available in April 2009? UPDATE: PDF specs and etón link added to post.